Ron Nash is convinced that students thrive and grow as active learners in ways they do not when they are simply passive observers. As the years go by, predictably, watching teachers work may become less and less exciting. Classrooms ought to be places where students can be students. In an educational career that has spanned four decades, Ron has taught middle and high school social studies; he also served as an instructional coordinator and organizational development specialist. 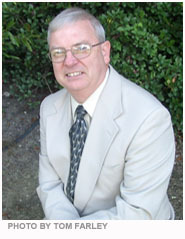 Ron retired in 2007 to create Ron Nash and Associates, Inc., a company dedicated to shifting students from passive observers to active participants in their own learning. A national presenter and workshop facilitator, Ron has conducted seminars and workshops for thousands of teachers, administrators, paraprofessionals, and substitute teachers. On a national level, he has presented at ASCD, Learning Forward, and Eric Jensen's Learning Brain Expo. Most of Ron's work has been in Virginia, where he and his wife, Candy, reside with their two cats, Callie and Gracie. Ron Nash may be contacted at RonConsult@cox.net. See what teachers say about Ron’s workshops and conference sessions!